Water Rescue Rope is a spliceable floating rope for use in swift-water rescue applications. The rope has a durable nylon sheath that protects the braided multifilament polypropylene (MFP) core from damaging UV rays. This combination results in a strong product that floats just under the surface of the water. TEUFELBERGER’s Water Rescue Rope is an 11mm double braid. This spliceable, floating rope is perfect for use in swift-water rescue applications. The durable nylon sheath covers the braided multifilament polypropylene (MFP) core and protects it from damaging UV rays. This construction results in a strong product that floats right under the water surface. 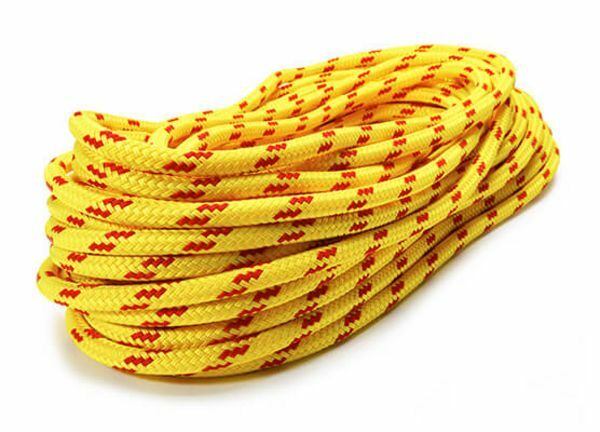 The high visibility yellow color (with contrasting red or blue flecks) is easily seen in the water and the ropes spliceable construction makes it perfect for all rescue situations that do not require an NFPA (National Fire Protection Agency) certified rope. The 11mm design makes this rope strong yet lightweight and the nylon core make it highly abrasion resistant. Its double braid construction combines the spliceable nature of a hollow braid with the safety features of a kernmantle rope. Water Rescue Rope is perfect for swift water rescue, rafting, boating, river crossing, swimming, or any other applications where a water rescue may be required. Remember, the rule is, Reach, Throw, Row, Go. Keep this line readily available and stay dry. Made in the USA! Our 11mm Water Rescue Rope is proudly made by expert crafts men and women in our US facility located in Fall River, Massachusetts.